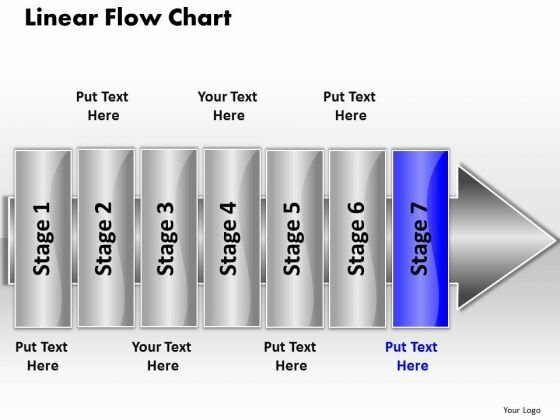 PPT linear flow 7 stages5 PowerPoint Templates-Use this PowerPoint Diagram to represent the layers of Linear Process model Graphically. This image identifies the concept of stages in process. This attractive image makes your presentations professional and interactive. Deliver amazing presentations to mesmerize your audience.-PPT linear flow 7 stages5 PowerPoint Templates-Linear Flow Chart, Abstract, Arrow, Blank, Business, Chart, Circular, Circulation, Concept, Conceptual, Design, Diagram, Executive, Icon, Idea, Illustration, Management, Model, Numbers, Organization, Procedure, Process, Progression, Resource, Sequence, Sequential, Stages, Steps, Strategy Ideas come alive with our Ppt Linear Flow 7 Stages5 PowerPoint Templates. Your thoughts will get animated. Raise the level of enthusiasm. Our Ppt Linear Flow 7 Stages5 PowerPoint Templates will give it a raise.